Posted on April 9, 2009 by Richard Masoner. In a recent N.Y. Times article, writer Allison Arieff laments that industrial designers have created too many precious, useless objects and calls for a return to “problem-solving” design. The article’s spirit is right in keeping with the cycling business trend towards commuter, cruiser and cargo bikes. Maybe one way the recession as good for design is to see it not as a form of punishment for frivolous designers but rather as an opportunity to allow for a rethinking of design itself — and the role of the designer within it. This rethinking needs to come not just from designers but from the manufacturers, companies and other clients who decide what products and projects will be produced. There’s no excuse not to examine and re-examine what’s made, how it’s manufactured, what materials are used (and which are recyclable), what benefit it’s giving the consumer (or lack thereof) and what contribution, if any, it’s making to anything other than landfill. 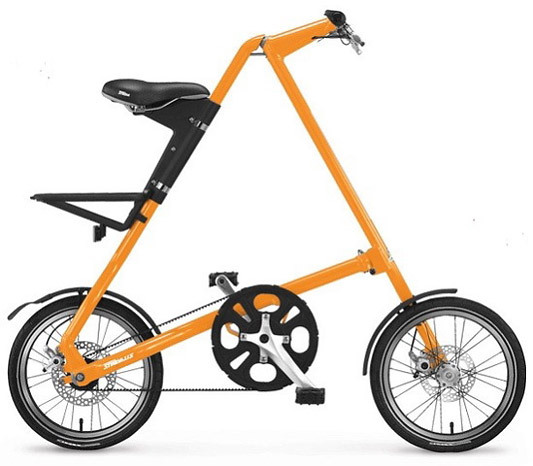 I'm sorry, but I can;t imagine a single person in the world who would see that orange folding bike and go, "Finally! Now I can give up my car!" The Strida wouldn't have been my first pick either, compared to, say,the Specialized Globe or Bike Friday or Breezer Uptown. Ariefff, the article's author, is a design person, not a cyclist. Nonetheless, the points she makes about what the goals of design should be are worthy of consideration. and that's exactly what Sanders designed the STrida for — a multimodal train+bike commute. No doubt it's a good folding bike, but I don't think I've ever heard the excuse "bikes are too big" as a reason for someone to drive rather than bike to work. Tony, the Strida was designed specifically for solving the "last mile" problem in mass transit, where size and weight of the bike is an issue. It's a tool more to enable public transportation use rather than just bicycle use.